A. F. writes How low is low for Chinese GDP growth? A. F. writes Is the Great Moderation back? Prior to the Global Financial Crisis the world economy experienced a period of increasing global imbalances where a group of countries saw their surpluses increase rapidly while, on the other side, a group of countries increased their deficits. These patterns were partly related to the "saving glut" hypothesis put forward by Ben Bernanke to explain the decline in global long-term real interest rates. It was also the case that some of the deficit countries (in particular in the Euro periphery) found themselves in a large crisis after 2008. This post is an update of the last ten years. 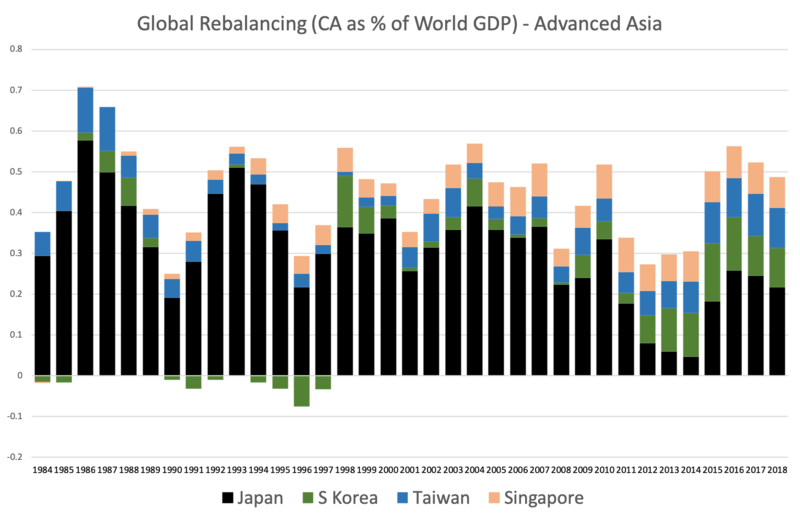 Today the world displays smaller imbalances than at the peak of 2008 but what it was more interesting is the extent to which rebalancing had happened between different country groups. Let's start with the global view. The Figure below shows current account balances as % of world GDP for some regions or groups of countries. Data goes all the way back to 1980 although data is missing for some countries before 1995 (see footnote on data sources). 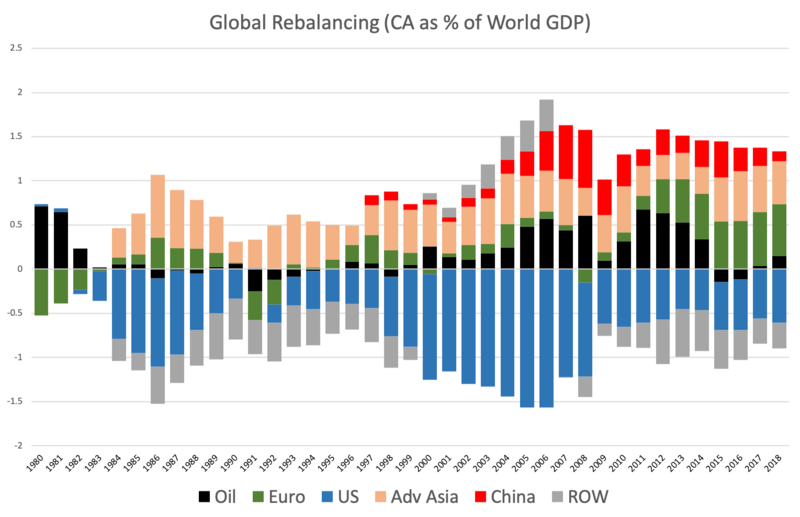 In the period 1998-2008 (Global Imbalances period) we see the increasing surpluses of oil producer countries, China, advanced Asia (this includes Japan, South Korea, Singapore and Taiwan) and the rest of the world (ROW, many of these countries are emerging markets). 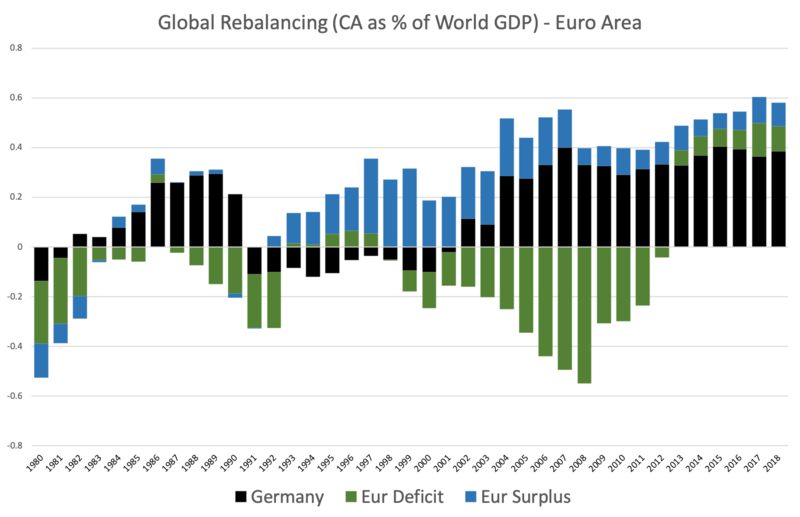 The Euro area remained quite balanced (more on this below) and the only deficit country in this figure is the US, absorbing all the surpluses generated by the other countries [of course, the US was not the only deficit country. Some of the Euro area countries had a deficit as well as some of the countries in the rest of the world]. China is moving fast towards a balanced current account (IMF forecasts suggest that China's current account will be balanced within the next 2 years). Oil producers have moved towards a balanced CA with small deficits in 2015-2016 as a result of the decline in the price of oil. Advanced Asia has maintained or increased its surplus relative to previous years. The US continues to be the country that absorbs most of the surpluses. The US deficit is smaller than in 2008 but remember this is measured as a ratio of World GDP not US GDP (relative to US GDP the decline would be less pronounced). While in 2008 many emerging markets were savers, in 2018 all the surplus countries are advanced economies (Euro and Asia). Some emerging countries appear under rest of the world as absorbing some of these capital flows. Some details on the two largest sources of surpluses today. What happened among advanced countries in Asia? The figure below shows that Japan was dominant in this group in the early years. But in recent years the increase in surpluses in Korea, Taiwan and Singapore means the three of them together have a larger surplus than Japan. Overall size is similar to before when measured against world GDP. If we were to measure it against their own GDP we would see an increase in surpluses. And finally the Euro area. I divide the Euro area into three groups: Germany and Euro Deficit and Euro Surplus. The last two groups are decided by looking at the pattern of the current account of Euro members (excluding Germany) during the 2000-2008 period. Countries that showed consistent deficits are in the first group while the others are in the second one. We can see the large increase in surpluses in Germany in the decade of the 2000s while the group of deficit countries massively increased their deficits. After 2008 we see a fast rebalancing from the deficit countries towards a surplus while Germany maintains (measured as % of world GDP) or increases (relative to its own GDP) the current account surplus. Data source: Current Account balances (in USD) and World GDP (in USD) from IMF World Economic Outlook database. Data from 1980-1995 is missing for some countries (in particular emerging Asia, including China). During those years they appear as rest of the world. Next How low is low for Chinese GDP growth?